For months, Elea Acheson heard the rustling of an intruder. She was pregnant and alone in a new neighborhood, her fiance often away on business. She’d throw open a window or rush to the door — and find no one. She even told family members the late-night prowler must be a ghost. Finally, she caught the trespasser in the act — on the stern of her boat. A mischievous neighbor harbor seal was breaching into the bay. The seal had apparently taken to flopping onto the swim steps of Acheson’s liveaboard vessel to bask in starlight. Such is life when a boat is home at Shilshole Marina, in Seattle’s Ballard neighborhood, where living aboard has its own peculiar joys and (mostly damp, cold and cramped) hardships. With a long tradition in the Pacific Northwest, it’s a lifestyle timeless, unique — and now evolving. As Seattle booms and the scramble for affordable housing intensifies, living aboard is both an escape from city pressures and also a reflection of their effects. Port of Seattle officials — who operate the public marina — say demand for liveaboard moorage has more than tripled since 2014. Rates have risen steadily in past years. In recent years, families seeking an affordable lifestyle, a connection with nature and the ability to pull anchor and travel have taken to the community. Some longtime liveaboards say the marina is more vibrant for its newcomers, but are concerned that as demand booms, not even this niche lifestyle can escape the Seattle squeeze. At Shilshole, hundreds of colorful vessels line docks lettered A through X. A rock jetty topped with a sea serpent sculpture guards the marina from wind and wave. At dusk on a clear day, the sun peeks over the snow-capped Olympic mountains, and silhouettes sails in a wash of gold. Shilshole offers 350 slips to liveaboards, and between 550 and 600 people call the marina home, according to Port officials. Mariners who lease slips that aren’t allotted to liveaboards can sleep in their vessels for up to two weeks each month. The views and the relatively affordable rent (known as moorage fees) are enough to make landlubbers flush with jealousy. Acheson and her fiance waited more than a year for their spot at the marina. That’s not uncommon, Port officials say. Most people can expect to wait between one and three years now. The officials say they can’t remember when the wait list was longer. About 60 percent of mariners seeking Shilshole moorage now apply as liveaboards. “That’s the highest percentage we’ve ever seen,” said Tracy McKendry, the port’s director of recreational boating. For now, liveaboard fees are capped as the Port plans upgrades to laundry and shower facilities that are stretched beyond capacity. But the Port has no plans to expand the marina or look to accommodate more vessels. In Ballard — where single-family homes are being razed to make way for condos — urbanists see denser neighborhoods as a solution to Seattle’s housing crunch. At Shilshole, there’s no such solution. For boats, “density is not an option,” Port spokesman Peter McGraw said. On a sunny spring day at Shilshole, Acheson sat on a settee with her infant daughter, LiLi, who sported a pair of pants with a crab on the rear. Toys, including LiLi’s favorite, Pig, spilled onto the floor of the boat’s cabin. Acheson has lived on board for more than a year and a half now. It’s a lifestyle of complications. At nine months pregnant, she couldn’t fit into the boat’s tiny shower. It’s a long walk to shoreside shower and laundry facilities. Supplies are carefully arranged in cabinets, and pulling an item from storage usually requires moving three others. There’s no privacy. Winters are freezing. When a surprise storm rolls through, and you’re pregnant, you must still wake up, batten down the hatches, and tie gear down on deck. The rewards are easier to understand. “The second you step on your boat, it feels like vacation,” Acheson said. Acheson and her now-husband spent about $14,000 on their boat, a “fixer upper” named “Bad Influence,” though the new parents are considering a name change. “I always wanted to own my own home and couldn’t afford it. I loved the adventure,” she said. The couple pays about $750 a month for their 42-foot slip, including taxes and liveaboard fees. Acheson, who grew up on Whidbey Island and recently toured the country by bike, said she loves Shilshole and the surrounding neighborhood. The marina offers relief from the constant buzz of cars. Staff at the nearby community center know her and LiLi by name. Acheson’s been using a Facebook group called “Buy Nothing” to find free baby and home supplies. She feels community in Ballard, but could not afford living here if not for the boat. “There is no way I would have considered living in a studio apartment for $1,500 to $2,000,” she said. Shilshole is home to mega-yachts, rust buckets, fishing vessels and racing sailboats alike. Its residents span the economic classes. Those who make it a long-term home are bonded by self-reliance, but also a sense of community and shared experience. “Any boat is in a constant state of deterioration,” said Meeks, who once worked as a yacht broker. Small costs add up quickly, said longtime liveaboards Kristen Sierra, 65, and Ned Kohlhauff, 73. Costs fluctuate, but Sierra estimates yearly fees and maintenance for a boat in good condition at roughly one-tenth of its purchase price. For reference, their 1981 42-foot vessel, Bristol Blue, cost $140,000. To break down some of their myriad expenses: Insurance costs about $2,200, more than for a typical Washington home. Most liveaboards spend $60 a month to pump out septic tanks. Hauling out a vessel for maintenance requires at least $1,200, Sierra said, and that’s before any major work gets started. Unexpected quirks can sink a budget. Once, the couple spent $440 for unique door handles no longer for sale. “We had to go to a foundry and have them made,” Sierra said. It’s handy do-it-yourselfers who survive. But neighbors are eager to help, share technical expertise and keep everyone afloat. Residents must trust each other. Fires at marinas spread quickly and can be catastrophic. Each Monday, Shilshole residents check marine radios and drill emergency communications. Each dock has an assigned captain. The Shilshole Liveaboard Association, made up of marina residents, serves as a voice to the Port and Ballard community. In recent years, more families began to call Shilshole home. Boaters left lights on last Halloween, so dozens of children could walk the docks in search of October’s sugary spoils. The community has its own Facebook page for parents. 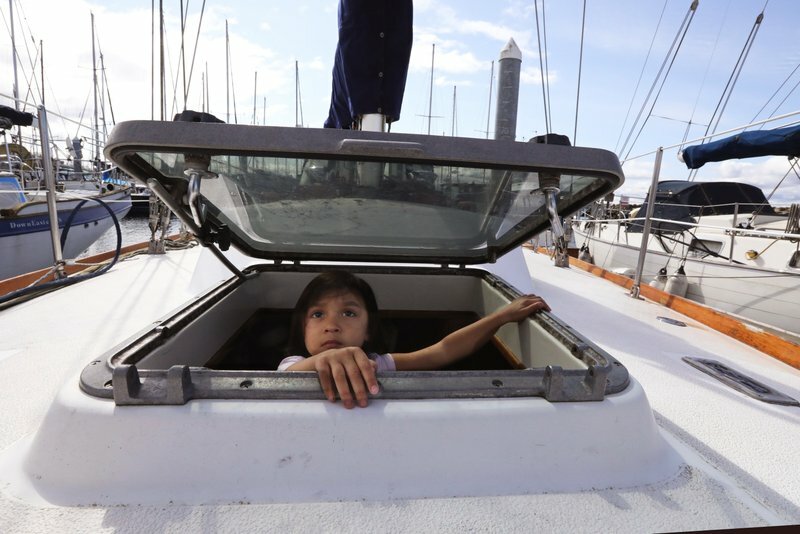 Some parents seek an alternative lifestyle with summers of adventure cruising the seas. Others value the bond of close quarters or choose life aboard for financial reasons. Roland and Gerry Rodriguez met when Roland worked in tech and traveled as a consultant. He struck up a conversation with Gerry, an Aussie, in Melbourne. Three months later they married. The couple moved to Seattle and lived in several neighborhoods, before finding a 1,800-square-foot Capitol Hill apartment, which rented for $1,750 in 2009 and then $1,900 in 2011. “As the babies kept coming, it was really hard to spend time with them,” Roland said, so he left his demanding tech job. Novice sailors who had a weekender sailboat, the couple decided to try living aboard full time and upgraded to “Whisper,” a 42-footer with two staterooms. They opened Jibe, a marina coffeehouse just a few hundred yards from their dock. Living on the boat allows them to home-school Isabella, 6, Abigale, 5, and Matilda, 3. The kids play in tide pools and spot salmon, jellyfish and starfish. They enjoy rides in the dock cart. The family will often take its dinghy nearby to “the secret, hidden beach,” Isabella boasted. Inside, it’s tight, but cozy. They have three shelves for toys, and no TV, but the kids don’t care (they prefer streaming video on iPads via high-speed internet). At Jibe one afternoon, several neighbors stopped by to chat with the children. “It’s kind of like living in a small town,” Roland said. When it comes to the liveaboard lifestyle, Sierra and Kohlhauff evangelize as well as Billy Graham. The longtimers’ vessel is lined with polished teak and nautical art. Their neighbor, a man in his 20s, decided to move to Shilshole after touring the couple’s boat during an open house at the marina’s Boatfest celebration. Sierra, the liveaboard community’s communications chair, once spent three weekends baking more than 1,000 cookies in her galley for an annual meeting at the marina. Their tales of cruising the Pacific are filled with enchanting scenes of far-off lands and harrowing storms that forced water, in sheets, down the bulkhead. As dock captains, they know their neighbors well. They’ve helped with maintenance and advised plenty of novice liveaboards. The couple cheers the wave of families settling at Shilshole. They’re happy to see the community grow more diverse in age, race and background. But they worry over rising moorage rates. Sierra, who is semiretired and focused on selling her artwork, started looking for jobs last year. They fear for retired neighbors and worry they might eventually be priced out themselves. “Whatever happens in the greater community, you have on a smaller scale here,” Sierra said. In Seattle, even people brave enough to live in 260 square feet and navigate open ocean can’t find safe harbor from the city’s economic waves.